R: I had cereal with my children before leaving for work. H: I grabbed something on my way out the door before biking to work with my dog. R: I am actually quite a good cook! I cook a lot for my family and guests stopping by. H: I enjoy watching cooking shows, but I am a terrible cook. I can make some mean salads, but that is about it. Do you dance at home? R: We dance if there is a party. And especially if they are playing pop music! H: Yes, some modern pop music. What is a good track/album/playlist to hang out? R: We have a colleague here at Baum und Pferdgarten who somehow always manages to create the perfect playlists to fit a situation! H: We are an extremely close team and we love to hang out across departments, and when we do; whether it is Friday drinks, coffee or just hanging, she manages to capture the mood. Are there any spaces/homes that have made an impact on you? R: We travel to Salone del Mobile every year, which is a giant design fair in Milano. It is a very important trip for us. H: It is where we can gather inspiration and just fill up. There are both exhibitions and amazing private homes that are made to be a showroom. H: Family. Family and friends make the home. No matter how empty it might otherwise be. Whats your favorite thing at home? R: I have some different designs from the designer Cathrine Raben Davidsen, both paintings and a beautiful lamp I really love. H: I have a green version of the Snoopy lamp from Flos, which I adore. It is fun but still classic, and no matter where I put it, it lights up the place. Both literally and figuratively! What should a sofa do for you? R&H: It should be the perfect surrounding for our families. Something that embraces life and the spilling that goes along with it. A sofa should – like the rest of your home – be a place for embracing calmness after a long day. And if you ask us, a sofa should also be either leopard or floral printed. Just because it is comfortable, it does not mean it has to be boring. 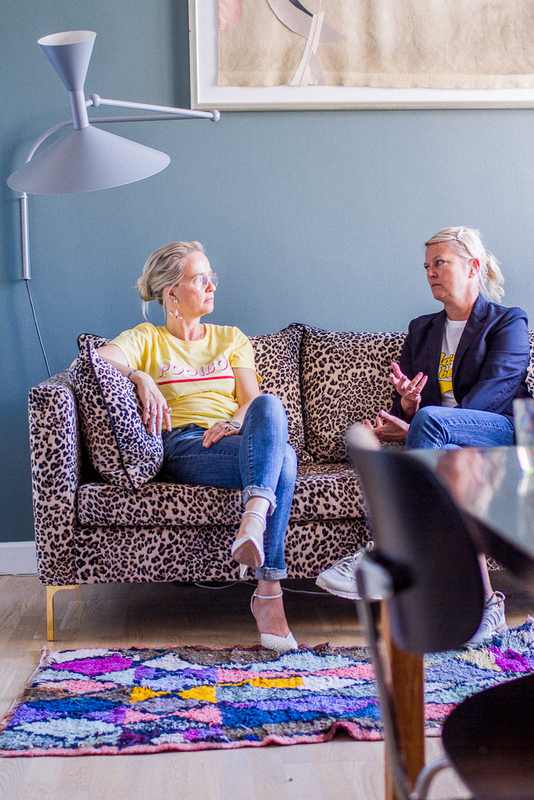 A chat between Rikke, Helle, and Jonas (COMMON), May 2018.